The proposed new bridge at Athlone. 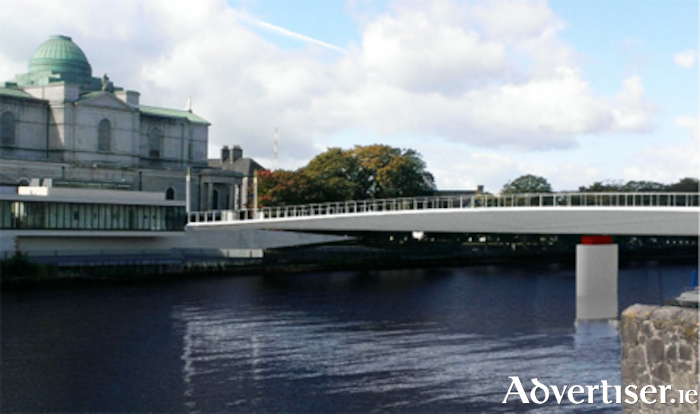 Minister Ciarán Cannon has welcomed the granting of planning permission for a new pedestrian and cycle bridge crossing the River Shannon in Athlone. The decision to grant permission has been issued by An Bord Pleanala and it now paves the way for an onwards connection to Galway city and Clifden. Development of the final leg of the Dublin to Galway greenway was paused by the then minister for transport, Paschal Donohoe, in October of 2015 because of major opposition to the planned route. Minister Cannon added; “A new national greenway strategy is now being developed by our current Minister Shane Ross which I hope will provide for a far more effective and meaningful engagement with landowners from Athlone to Clifden. I expect that it will also focus on the use of State owned lands as the primary opportunity in developing greenways nationwide.